This dungeon is required to advance in the story line. 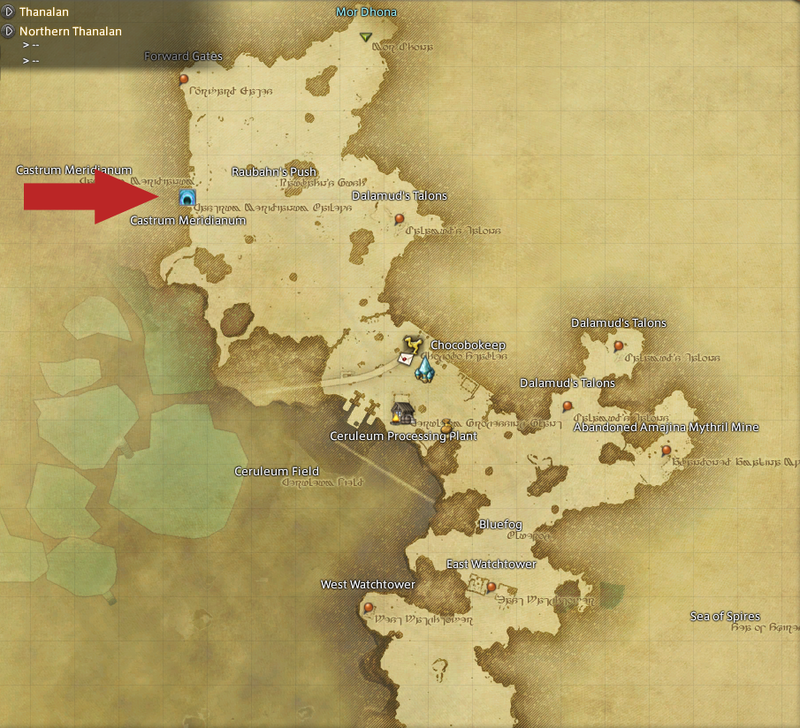 It is located in the west part of Northern Thanalan (15,17) and can be entered via the Duty Finder. You must have obtained the 'Rock the Castrum' quest to unlock this dungeon. Completing this dungeon will unlock The Praetorium. So begins the third phase of Operation: Archon, which entails a frontal assault upon Castrum Meridianum, Gaius van Baelsar's seat of power. Forming the main thrust, the Immortal Flames will strike at the stronghold with all their strength, though this is but a feint. While the garrison's eyes are drawn outwards, you and your comrades must steal past its defenses and attempt to deactivate the magitek field which protects the Praetorium, the fortress within a fortress wherein the Ultima Weapon is believed to be housed. Castrum Meridianum is a level 50 dungeon required to advance in the main storyline. It is the second time you will be paired up in a 8 person party, which will be 2 healers, 2 tanks, and 4 DPS. Pair up with some friends or queue up in the Duty Finder. The waiting time can be up to an hour if you are a DPS - and since it is a story quest instance, it may take even longer as the content gets older, since more and more people will have already finished it, however, there are a number of people who like to run it for Tomes of Philosophy so that should help. There are a lot of cutscenes, as well, so be sure to warn others in the group that you intend on watching them. The dungeon is an Imperial outpost, so most of the enemies will be Magitek and Garlean Soldiers. The trash pulls are pretty harmless and if you have two competent healers, the tanks can even pull two mobs at once. There are a few mobs that can be skipped entirely, so be sure to stay close to the walls to stay out of line-of-sight from these enemies. You must deactivate spotlights as you venture through the dungeon, so be on the lookout. Cid will also show-up a few times to help you with your endeavours, what a nice guy!